Can you believe it is the end of January already? 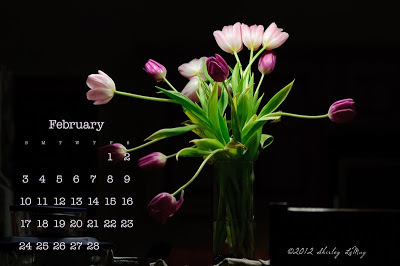 A new month means a new calendar - February's calendar for your computer desktop. I often get inquiries about a photo like the one featured in February's calendar - sometimes I am asked if I used a black backdrop or a special light set up. The answer is no. I shot the bouquet at night, at the kitchen table. The lights are all out except for those above the kitchen table. The lights create a spotlight for the flowers. Then I used the spot meter on my camera (DSLR's will have this option, many point and shoot cameras do too - even my iPhone 4S has the ability to spot meter somewhat) and metered the bright part of the bouquet. The result - a dramatic bouquet on a black background. Hopefully you've found this month's calendar post useful. Be sure to check back at the end of February for next month's calendar link! Beautiful Shirley! Thank you for the tips too! It's just a gorgeous photo all the way around, Shirley. wow, that is dramatic and beautiful. I love the font you used to make your calendar. I've tried fumbling in PS to try and make my own monthly calendar but it's a nightmare to get everything spaced and even so I gave up. I admire people who have the patience and know-how to type in and line up all those letters and numbers. Beautifully image and calendar. Thanks for the tip on the lighting, it's perfect for this bouquet. What a wonderful shot AND it warms up this cold weekend!